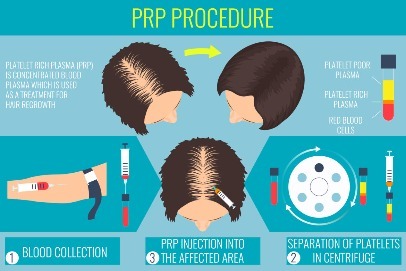 PRP therapy is a non-surgical natural hair restoration process utilizing platelets from a patient’s own blood and delivering them directly to the problem area to regenerate and regrow lost hair for natural looking results. The application of PRP causes miniaturized hair follicles to become healthier and larger, producing more robust hair growth. PRP has been shown to be very effective and suitable for both male and female pattern hair loss. ​Hair growth improvements can typically be measured in about three months, but it takes six to twelve months to visually “see” the difference in photos and in the mirror. Multiple treatments are required in the first year, typically 2-3 months apart. After the first year, most patients will require treatment once a year in order to maintain the hair growth effects. ​Patients with certain blood disorders or on certain medications are not candidates for PRP treatments. There is no activity restriction after a PRP treatment. Patients may shower/shampoo/condition their hair normally just several hours after the treatment and resume normal daily and athletic activities. ​Most patients notice a brief period of inflammation during which their scalp remains somewhat pink and numb for a few hours. Swelling is rare and if it occurs is noticeable in the forehead or around the eye area on the next day. Any swelling takes about a day or two to resolve.